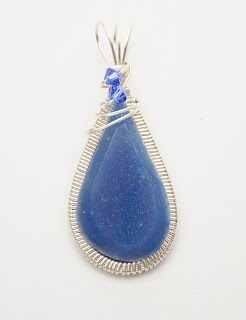 Gorgeous wire wrapped pendant of deep blue quartz sculpted in sterling silver wire, with two blue Swarovski crystals that accentuate the color of the cabochon. The color is a cross between a deep denim blue, a deep cornflower blue and a cobalt blue. This pendant measures 7/8" long by 2 1/8" wide and the bail will fit on chains of 6mm wide or less.